Raise your hand if you thought the Blue Jackets would come home with a 2-0 lead on the Tampa Bay Lightning. Put your hand down, you liar. 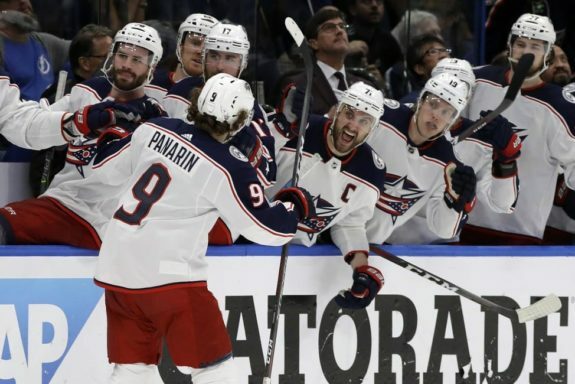 The Blue Jackets did the almost unthinkable and won the first two games at Amalie Arena, including a decisive 5-1 win in Game 2 on Friday night. The question on the minds of many is how did this happen? In short, the Blue Jackets came in with a perfect game plan and have executed it. The looks on many of the Lightning player’s faces said it all. They were frustrated and bewildered. We’ll discuss this in more detail in our takeaways section. For now though, we need to revisit the Blue Jackets’ darkest hour of this recent stretch. Recall the doom and gloom the Blue Jackets were in after a terrible 4-1 loss to the Edmonton Oilers. They were on the outside of the playoff picture. They looked lost and confused. All that talent looked like it was going to waste. Panic was everywhere. What was said in that meeting? Only those involved know and they’re not sharing. But whatever was said needed to be said. Any differences were smoothed out. It was the much needed turning point in a season where Columbus needed something special to happen. Since that meeting, the Blue Jackets have lost just once. They got into the playoffs by a slim margin and haven’t looked back. They are firing on all cylinders. What were they able to do in such a short period of time to right the ship? In my mind, it comes down to one very important thing. Trust. For the first time since the trade deadline, the Blue Jackets demonstrated an ability to trust each other no matter what the situation was. Instead of trying to take matters into their own hands, the Blue Jackets returned to a team concept starting that Sunday night in Vancouver. The result was a convincing win. They continued to build from there. That brings us to today and why this trust matters. It started in Game 1. Sergei Bobrovsky looked very shaky in allowing three first period goals. Did the team need a wake-up call? Was Bobrovsky in over his head? Enter the decision making of John Tortorella. Tortorella could have pulled Bobrovsky. He had every right to do so. Instead, he trusted Bobrovsky would fight through it and give his team a chance to win. Thanks to a couple of key saves in the second period on both Steven Stamkos and Nikita Kucherov, Bobrovsky found his confidence and that resonated through the team. We all know what happened next. Nick Foligno broke the ice. Then David Savard, Josh Anderson and Seth Jones finished the deal and gave the ultimate payoff to the trust Tortorella put in Bobrovsky. Without this moment, there might not have been an epic comeback. The trust factor continued in Game 2. With the score 3-1 in the third period, the Blue Jackets faced their biggest test after a Lightning goal and a quick penalty after. The Blue Jackets killed the penalty, but it’s what Tortorella did after that shows the trust he has in his current lineup. Who came on the ice after that kill? It was the fourth line of Brandon Dubinsky, Boone Jenner and Riley Nash. The score was still 3-1 and the Lightning had some momentum. But there’s a reason why Tortorella trusted this trio to go out there in that situation. They were capable of flipping momentum back on their side. They did so in the biggest way possible, a back-breaking goal. Jenner makes a great play to keep the puck in the zone. He fed Nash and he scored a huge goal to put the game out of reach. Not many coaches would turn to their fourth line in that situation. But when trust is there, it makes a world of difference. They paid off Tortorella’s hunch and are part of the reason this series is 2-0 Columbus. You can see the trust factor up and down the lineup. The lines are showing great chemistry. The defense pairs are on the same page. They know where each other will be and trust that the other will do their job. As a result, these Blue Jackets are closer than ever. If they can continue on this path, they’ll shock the world. But there is still plenty of series left. What else have we learned in these first two games? Let’s dive in. Want to talk about a perfect game plan? Look at the way Columbus is defending Tampa Bay to this point. First, the neutral zone has no room. The Lightning haven’t consistently been able to generate the type of speed they’re used to. But even when they do get in, the Blue Jackets have emphasized keeping the front of their net clear so Bobrovsky can see the shots. This has been a clinic and the Lightning really haven’t seen this all season. If they don’t adjust quickly, this series is over. Matt Duchene is motivated. These playoffs are personal for him. He’s never enjoyed playoff success and is a UFA after the season. His four points Friday was a Blue Jackets’ franchise record for a playoff game. He’s out to prove how great a player he really is. Speaking of Duchene’s impact, the 2-0 goal Friday was all about the clean faceoff win. Who won that draw? Of course it was Duchene. Thanks to that win, it took the Blue Jackets’ power play just four seconds to make the score 2-0. All season, the Blue Jackets struggled on the power play because they’d lose a bunch of draws and had to chase the puck. With Duchene’s faceoff prowess, they get more zone time and increase their chances of scoring. This is why the Blue Jackets wanted Duchene. He’s a difference maker and showing it. A big question was if Scott Harrington and Dean Kukan could handle things with no Ryan Murray and Adam McQuaid. So far, so good. Their minutes are limited but are still playing significant minutes. They’ve avoided the big mistake which is all you can ask for. They’ll be depended upon moving forward as Murray and McQuaid aren’t close to returning. Kekalainen had no update on them Saturday morning. Speaking of trust, how many of you would trust Alexandre Texier in a big playoff series with his limited experience? He’s doing well showing once again the power of trust in big moments. David Savard is having the series of his life at both ends. If he’s not shutting you down, he’s dangling Victor Hedman. The Blue Jackets are actually really good too. When Boone Jenner is your fourth line center, you’re a deep team. What am I watching for Sunday night? Here are my five things. The Lightning have their backs against the wall and might not have Nikita Kucherov. This game will either bring them back together or could put them on the brink. If Kucherov misses time, how will the Lightning adjust and what will the lineup and lines look like? Can Columbus take advantage of Nationwide Arena? The building will be loud and rocking hoping their team wins a third game in a series for the first time ever. They need to play like they did in Tampa and not get too cute. And will they apply the lesson from last season to now? The Lightning have had some success from their bottom-six in this series. Can the Blue Jackets tighten their game up against them as well? They’ll be depended upon more with Kucherov likely out. The Blue Jackets overcame adversity in Game 1 and will likely have to do it again to win this series. With the pressure increasing as this series moves on, can they maintain this kind of game all the way through? And when things go south, how will they handle it? Curious to see how Tortorella uses the last change in these next two games? What matchups does he like and want to exploit? This could be an important part of how these games go. Time for the Blue Jackets to take advantage of being at home and the perks it comes with. Game 3 is Sunday night at 7. We’ll either have a new series or an incredible 3-0 deficit. Can Columbus keep it rolling or will Tampa find a huge response? It doesn’t get much bigger than that this early in the playoffs.